“Remember that violence cannot be defeated by violence; violence can only be defeated with peace — with peace, effort and dignity to move the nation forward,” he told those who greeted him during a 20-minute visit at the Dehiyshe Refugee Camp’s Phoenix Cultural Center. As Pope Francis arrived he was warmly welcomed by the center directors and representatives of the camp. He entered the center flanked by a boy and a girl in traditional dress. A large white chair was brought out immediately so he could sit inside the main hall. Speaking in Spanish, which was translated into Arabic by a Franciscan priest, Pope Francis said he had understood the children’s English words, and the Arabic had been translated for him. A boy from the camp welcomed the pope in the name of all the children and told him that the camp was a symbol of Palestinian suffering. 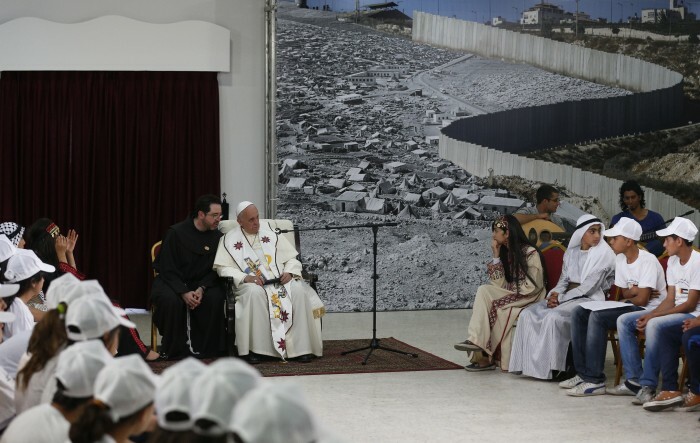 He told the pope that the Palestinians were in need of his prayers and support to rid themselves of the occupation. The children sang a song of brotherhood and unity in Italian, then sang a song of longing for their land in Arabic. “We send you peace from the land of our ancestors,” they sang. After they finished the pope complimented the children on their singing, and they presented him with a large carved olivewood arm and hand grasping a key, symbolic of the homes they lost. “May God bless you, and I ask that you pray for me,” Pope Francis said. As he walked out, the pontiff stopped to shake the hands of the children, spending a few moments with them.